Never Relax, and never mind Frankie | Trulyblonde? The Law of Averages is the belief that a rare occurrence will happen given enough time. For example, if I date enough guys the law of averages says that I’ll eventually like one of them enough to stay with him. I do the Lotto each week even though there’s no statistical basis for believing that my numbers will one day come up. Why should they? It’s a gambler’s falacy to believe that a rare occurrence will happen given enough time, yet I continue to play. Sod’s Law, of course, means ‘anything that can go wrong, will.’ Any attempts to control our destiny will be thwarted by fate so there’s absolutely no point in trying to contrive a situation where you’re the perfect person, living in the perfect moment. It doesn’t exist. On a broader scale is Murphy’s law – meaning whatever can go wrong, will. A particular favourite of mine, Murphy’s Law always visits in threes. 1) If you ever try to avoid an ex-friend and his wife at a party, never run in the opposite direction. They’ll turn unexpectedly and ‘bump’ into you when you’re quite obviously running away. When the history of the story is written, it won’t matter that he drunkenly told everyone that you made a pass at him (untrue!) ten years ago which got him into a whole heap of trouble – all that anyone will remember is that you were caught throwing kids out of your way to escape talking to them. 2) False eyelashes are only for gorgeous girls who remain unflappable in all sorts of situations. They’re not for chicks who get blind drunk yet insist on wearing their eye mask (and nothing else) to bed at 5am, who then wake up find one eyelash missing and the other crawling down their cheek like a spider. Screaming and banging your head off the bathroom door hurts, and certainly isn’t worth the ‘wide eyed’ effect of the lashes. 3) If you live 5 minutes from O’Connell Street and can make it to Easons and back at a brisk trot in 8, you are actually saving on time. You’re ahead of the game and – therefore – it’s your duty to yourself to ensure you’re game ready. 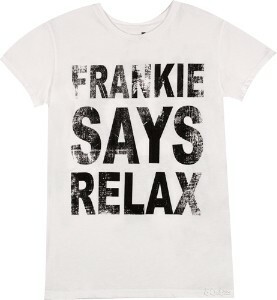 Running slap-bang into someone you definitely at sometime want to kiss in your Frankie Says Relax t-shirt isn’t good for the soul, even if the guy – and all his work mates – thought it was fairly funny. Bras were invented for a reason. Wear one.